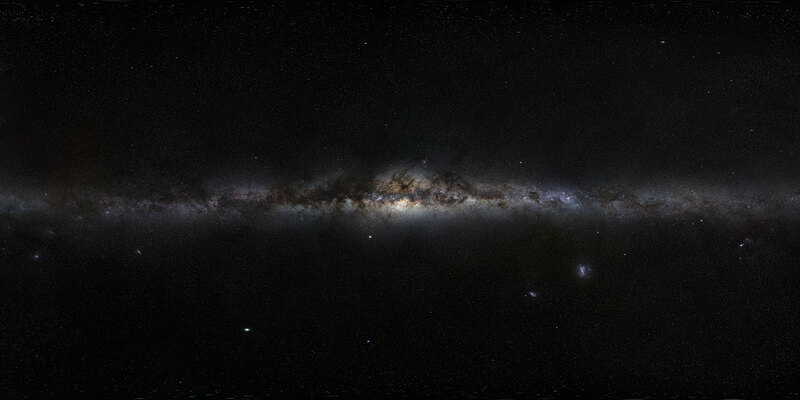 Radio telescopes have played a pivotal role in the understanding of galactic evolution. Their ability to “see” regions beyond the optical view of a galaxy, have brought significant insights into how galaxies form and develop. However, despite this progress, it is still a mystery as to how the early galaxies, in the millions of years following the Big Bang, began to evolve: where did they get their material? what drives their rotation? what has shaped them? The SKA’s unrivalled sensitivity and resolution will be able to track young, newly forming galaxies at cosmological distances, and, through mapping the distribution of Hydrogen, help us unravel these key mysteries. Hydrogen gas moving at different velocities within a galaxy will be detected at slightly different frequencies because of the Doppler effect. Astronomers can infer how quickly a galaxy is rotating by measuring the range of frequencies over which a galaxy’s 21 cm radiation occurs. From these measurements, it is possible to deduce the total mass of the galaxy, as it must have enough mass to ensure that it remains whole (and essentially does not fly apart!). This amount of mass can be compared with that estimated from the stars and gas that we can visibly observe in the galaxies. Often the hydrogen gas is rotating faster, sometimes much faster, than the amount of mass contributed by the stars and gas would suggest, implying there has to be some other kind of matter within galaxies – so called dark matter – that produces no light, but produces gravitational attraction such that the galaxy does not fly apart. The emerging structure of the Universe. Image: SKA Organisation / Swinburne astronomy productions. The gas has been blown out of the galaxy by powerful winds from hot, young stars, and once sufficiently far away from the influence of the stars, has started to fall back onto the galaxy. The gas represents ‘pristine’ or ‘primordial’ material from the very early Universe. It is possible that not all of the hydrogen in the Universe was captured within galaxies. Some of it is likely to still be in the space between the galaxies. Over time, that gas may slowly fall into galaxies, probably in the form of small clouds. The gas represents starless satellite galaxies. Numerical simulations of how galaxies form suggest that a major galaxy like the Milky Way should be surrounded by many smaller galaxies. However, various attempts to find such a quantity of smaller satellite galaxies have been unsuccessful. It is possible that some of these satellite galaxies have not yet formed stars, but consist only of gas (or the numerical simulations are not fully describing all of the physics!). Observations of many more galaxies are required to distinguish between the possibilities, and the SKA will conduct surveys for clouds of gas and search for undiscovered star-less satellite galaxies lurking around major galaxies. Both the star light and the hydrogen gas in galaxies in the relatively local Universe have been mapped in exquisite detail over the last few years by projects which are providing key scientific input in to the SKA such as the HI Parkes All Sky Survey (HIPASS), Arecibo Legacy Fast ALFA (ALFALFA) survey, the 2dF Galaxy Redshift Survey and the Sloan Digital Sky Survey (SDSS). Our challenge now with the SKA is to provide equally good measurements in the distant Universe. Such measurements will enable astronomers to track how galaxies acquired the hydrogen gas, from which stars could form, as well as track the various processes by which galaxies might gain or even lose gas. How does the increased sensitivity and resolution of the SKA play a role in this work? Sensitivity is a measure of the minimum signal that a telescope can distinguish above the random background noise. The more sensitive a telescope, the more light it can gather from faint and distant objects. The SKA’s sensitivity stems from the huge number of radio receivers at low, mid and high frequencies, which will combine in each frequency range from the locations in Africa and Australia to form a collecting area equivalent to a single radio telescope 1km wide. Resolution is a measure of the minimum size that a telescope can distinguish, effectively going from a blurry image to discerning the detail. The large distances between receivers of the SKA will provide the ability to distinguish the details. The combined factors of sensitivity and resolution will dwarf all existing telescopes currently in operation, and give the SKA an unparalleled view of the early formation of our Universe. Data from space telescopes looking at the Cosmic Microwave Background sky has shown the Universe is approximately 13.8 billion years old. The SKA will enable scientists to study this galactic formation at distances much greater than is possible to detect today.